Meyda owns and operates a 180,000 square foot facility that includes a full staff of engineers and nearly every manufacturing process under one roof. The firm specializes in quality and lead time control; no project is too large or complex. 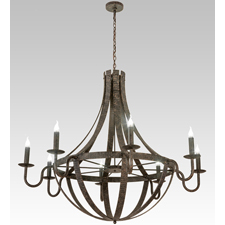 Buyers and specifiers can choose from a vast product offering or collaborate to create custom Made in America lighting fixture. The California Title 24 Building Energy Efficiency Standards are designed to ensure new and existing buildings achieve energy efficiency and preserve outdoor and indoor environmental quality. These measures are listed in the California Code of Regulations. The California Energy Commission is responsible for adopting, implementing and updating building energy efficiency. Local city and county enforcement agencies have the authority to verify compliance with applicable building codes, including energy efficiency. Meyda Lighting is a Meyda Tiffany Company, a leading manufacturer and designer of custom and decorative lighting and Tiffany lamps. Founded in 1974, the firm’s roots date back to the early 1900s supplying Tiffany Studios with original lighting products, including the original Coca-Cola stained glass fixtures. Meyda Lighting is headquartered at 55 Oriskany Boulevard in Yorkville, New York. For more information, Tel.1.800.222.4009. Website: www.meyda.com. Email: Sales@meyda.com.